A few weeks ago, QBAP, IBAP and MBAP returned from the masjid with a itty bitty kitty trailing behind them. According to QBAP, " I saw a kitten following a man on the road. I asked him if it was his and he said it had followed him from the market. I picked it up and stroked it then put it down. Then when we were walking on the road I stopped and felt something bump my leg. It was the kitten!" So the kids fed it milk and chicken liver and it hung around the house the rest of the day. QBAP named it Qastin, after himself. It would take its nap within the generator while it was off. Everyone was really excited about it. Even ZBAP (1 yr) liked holding it. The kids brought it indoors so Ummi could meet and stroke it too. 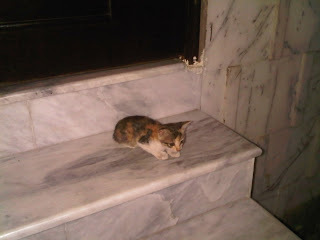 We had gone out that night and when we returned we found it sitting on the top step of our door steps. That night it was sleeping in the generator, when its frantic mother arrived and took it home. We were sorry about it, the kids searched the neighborhood for it and still keep a watchful eye for it when they go to pray, but Alhumdulillah we are thankful for the time we received to enjoy its company and happy to know the little baby was back with its loving mother. ZBAP looks so much older now and is so brave, mashaAllah! Peacefully enjoying the kitty's company, mashaAllah!